"Throwing away food is like stealing from the table of those who are poor and hungry," uttered new Roman Catholic Pope Francis in his public address last week. "Consumerism and a 'culture of waste' have led some of us to tolerate the waste of precious resources, including food, while others are literally wasting away from hunger," the Pope elaborated. The Pope makes an astute point that connects two disturbing, widespread trends: hunger and food waste. Tens of millions of Americans go hungry on a daily basis. In December 2012, the number of children and adults on food stamps reached an astonishing, all-time high: 47,792,056, more than half children. Fully 15% of all Americans. U.S. food waste has jumped 50% since the 1970s. Food waste is now the single largest component of waste in U.S. landfills. No, your half-eaten leftovers obviously can't be shipped off to feed starving children in China, as U.S. mothers famously threatened kids dawdling over their veggies. 1. Cut down first-serving portions at meals. Today, portion sizes have grown two to eight times larger than recommended standard serving sizes, per the NRDC. 2. Cook only the amount of food needed for that meal. 3. Repurpose leftovers rather than dumping them. Clever restaurants constantly find new, tasty second-life for cooked, unserved foods, especially meats. 4. Write a grocery shopping list, and stick to it. Don't be dazzled by deals and displays for which you have no specific recipes or plans. Be aware that grocery stores will tempt you mercilessly to make that useless impulsive purchase. 5. Educate yourself on how to buy and store produce, and on the shelf life of various fruits and veggies. And don't buy more than you will realistically use within one week. 6. Use overripe produce, don't dump it. 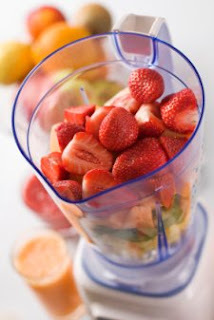 Overripe fruit is perfect for delicious smoothies and homemade popsicles. Overripe tomatoes and other veggies are ideal for home-simmered sauces. 7. 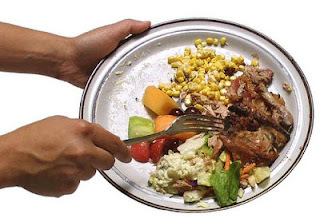 Still have food waste? Toss it in a compost pile... yours or a community compost pile... to nurture future gardens. And our future food supply. Your household goal should be zero food waste! It's good for your budget. Good for our world, Good for your soul. Need even more tips and recipes to help you actively move toward zero food waste? Try this site: From Garbage to Gourmet, which features "over 80 recipes and creative ideas for using... things that most people throw away without thinking about it, but can be used to make incredibly food!" Currently our compost pile is looking a little weak because most of our leftovers are going to the hogs. I was chastised the other day by my daughter for leaving a piece of Subway food (yeah, yeah, I know) in my car and not giving it to the hogs. As to #4 (shopping list) I really need to improve on that.